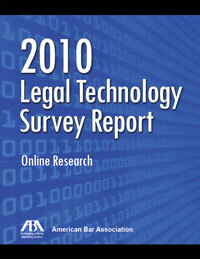 I received a copy of the ABA 2010 Legal Technology Survey last week. I was more than happy to get it as I’ve regularly used statistics from the Online Research volume. I would recommend its purchase as this year’s survey is exceptional in its review of how lawyers use technology while researching. It also provides a look at how those same lawyers interact with their law firm library. How often do you request legal research (both legal materials and non-legal materials that are case-related) from the following – Firm librarians? While the 12% for never doesn’t surprise me, the 43% for occasionally is troubling and the 18% for regularly is even more disconcerting. 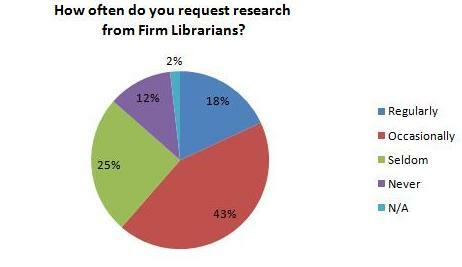 As to the occasional users, this is 43% of lawyers who have asked the library to do research but did not decide to return for help regularly. If I were in marketing, I would focus on that group in particular. They’ve seen the benefit of the library doing research enough to return occasionally but haven’t turned into regular customers. If I were to ask the same question in a survey that I did for a law firm library and got these results, I would suggest that the library interview those who are occasional users to find out why. The interview should start out with the question, “Would you tell me about your practice?”, followed by “What are your biggest frustrations in finding information?”, and go from there. Don’t focus on telling them what you can do for them, instead, find out what their needs are. This approach is marketing. Telling them what you can do is selling. Additionally, I would suggest that they talk to their regular users to find out what makes them so. I would also ask those users if they would be willing to provide testimonials and referrals when they have the opportunity – or more formally, at their practice group meetings when the library presents. Where do you go first to start a research project? These statistics paint a somewhat bleak picture. I really don’t know where to start with my thoughts on this. If you think back to how research used to be done, it generally started with editorial analysis of a legal issue using a print treatise. I guess shouldn’t be surprised by the 13% for print. Afterall, it is well-known that lawyers coming out of law school during the last 5-10 years prefer online. It’s the 54% for free online services and the 30% for online fee based services that are more troubling. I’m not saying that free services have no place in research. They do if they are services that are authoritative, can be relied on, aren’t biased, etc. What worries me is that I don’t really know what resources these lawyers are using. According to the ABA survey, 36.7% of lawyers in the 100+ lawyer firms are using Google search most often for their “free” research rather than using authoritative sources. While the number is the largest in a group that included Findlaw, 10.9%; LexisOne, 1.4%; Government websites, 22.4%; State Bar Association offerings, 9.5%; or the Cornell Legal Information Institute, 13.6%, it doesn’t tell us much about what resources are actually being used. I guess I should trust that these lawyers know what they are doing. If I didn’t have 20+ years of experience of seeing new law classes coming to work in law firms without a clue of how to get started with their research, I might be able to do just that. In the days when print research was used more readily, at least, I knew that someone using the print to learn about a legal issue before going online (fee based) was using a resource that was generally credible and authoritative. Now, I’m not so sure. 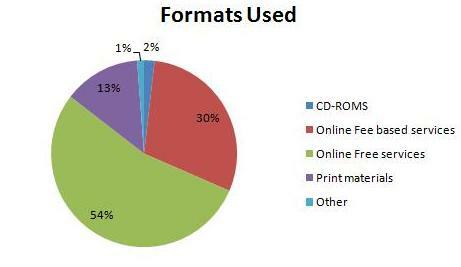 So what can be done to allow librarians (and partners) to feel better about the use of online over print? Whether law firms what to invest the time or not, training is really the best way to handle this troubling issue. At my last law firm, we were able to get a training session approved as required training for new fall associates (we did something similar for summers). This session focused on how to use the print and online resources most effectively. If I were working with a law firm in today’s research world, I would suggest offering similar training, followed by assignments of research mentors (something we did at my last firm as well). Look for more highlights from the survey along with commentary in our next blog post. Also, I would be extremely pleased to hear from you on these thoughts. Categories: Research, Surveys, Training | Tags: ABA 2010 Legal Technology Survey | Permalink. I believe Nina is on to something with training and mentorship. Perhaps combining the two might be a way of pointing out the importance of authority to the new generation of researchers. Large law firms especially, who have already divided staff into specialist, can obtain this with just some simple marketing.